Protecting your deck will be the first step you’ll need to take in the aftercare of brand new boards. For existing structures, remember that these will need thorough cleaning & potentially restoration first, before undergoing protective treatment. In this guide, our experts will teach you how to look after your decking with the right care & attention so as to preserve its lifespan for as long as possible. We’ve also chosen 3 of our favourite UK deck oils to help you protect your outdoor structure. Section 1: What Are The Best Decking Oils & Staining Products? 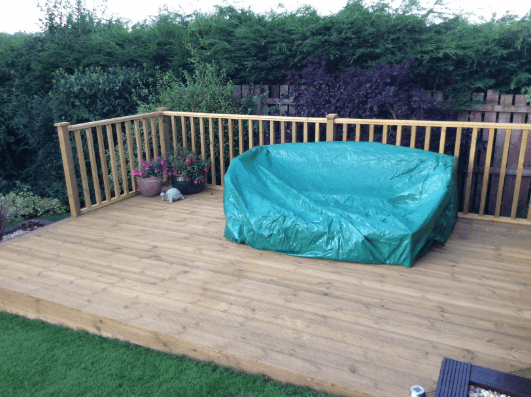 – How long do decking finishes last? 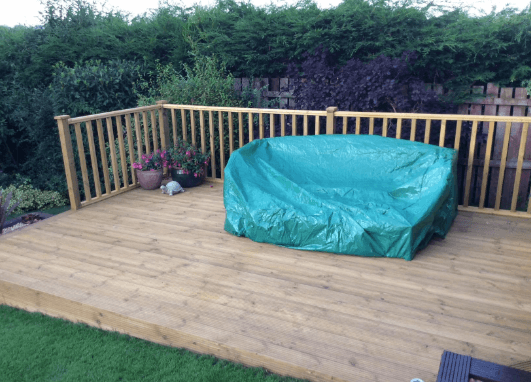 – How can I colour my garden decking? This oil is best for those looking to darken their deck surface, while also protecting from the elements. You can't go wrong with Liberon! A staining product - this is best if you're looking to actively change the colour of your deck. Anti-slip granules help prevent slipping. Translucent protection that won't change the current colour of your deck. Will help your deck boards to resist insects, rot & moisture. Section 1: What Are The Best Decking Oils, Treatment & Staining Products? There’s a huge range of decking treatment products on the market that can be used to protect your decking surface. Whether you’re looking for a staining product, protector, sealer or oil will depend entirely on your desired outcome. Generally we recommend you avoid sealers given their tendency to peel soon after application. 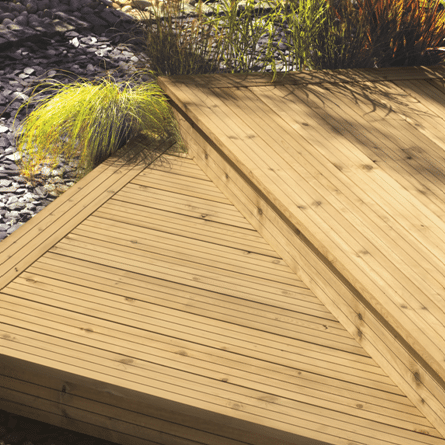 However, there are a couple of products we’ve had an overwhelmingly positive experience with – and from what we can tell, online sentiment seems to agree that these are definite favourites for decking owners in the UK. Liberon’s Medium Oak decking oil is our #1 top pick for those looking to protect their surface. Given this is a decking oil – you should only use this product if you are prepared to darken your surface and emphasise the grain in your timber. Otherwise you should check out the two alternatives below which offer less drastic or transparent colouration. The thing we love most about this oil is its longevity – it really soaks deep into the wood for a long-lasting coating. We get a lot of heavy rain in the UK so it’s important to find a product that can stand the test of time. Our experts usually give their decking one coating every year and that’s more than enough to keep the deck looking like new all year round. It usually retails at between £35-£40 for 5 litres so it’s definitely not the cheapest product on the market. However, it really holds its own against rival oils and really looks great when used to revive on an old, tired deck. If your deck has suffered from UV exposure over the years and has begun to fade under the sunlight, this is the product for you. Equally, if you have somewhat neglected your deck and it has become grey or covered with algae, you will probably get a lot out of this product after a good clean of your surface. This is the best oil on the market for restoring colour to a deck. We love this Cuprinol staining product and it seems that many others do too. It has tons of fantastic reviews on Amazon! If you’d actively like to change the colour of your deck, rather than darken or just preserve it, then this is the product for you. The product contains active anti-slip micro-beads (which are invisible), that stick to your surface and improve its grip. For this purpose, the product has lots of good feedback and we’d recommend it if your deck has been particularly slippy in the past. This is generally advised if you are hosting parties on your decking as the last thing you want is someone slipping on the surface. The other active ingredient is algicide, which helps to protect your timber from rot and mould growth that can damage your surface and cause it to turn green. Provided you re-apply every 1 or 2 years you should experience no problems with the disintegration of your decking during this time. Generally we’d recommend two coats for an existing deck and up to three coats for new decking. Cuprinol suggests that this product can provide 2 coats for up to 40m², though generally we’ve found it can cover roughly 25m² with 2 coatings. I suppose this depends how liberally you apply the product but if you have a very large deck, you may need two cans to be safe. 5L will generally be more than enough for the average deck owner. If you apply this product in warm weather (as recommended) then you’ll find the first coating should usually be dry within 30-45 minutes. You are fine to apply the second coating soon after. Read Cuprinol’s application guidelines to ensure you get the most out of this product. In terms of the look & finish – users have generally reported a warm-yellow finish, so this product is generally only recommended for softwood and pressure-treated timber surfaces. Cuprinol does offer this product in a range of other colours/styles (see below) and these generally have just as good feedback from customers. If you’re looking for a fully transparent product that will simply sit on your existing surface and protect it without changing the colour – then Ronseal’s Natural product is probably the one for you. It is water-based which means it works very well with surfaces that have become dry and cracked with age. This moisture content also helps prevent the wood from splitting which can easily happen with surfaces that are regularly exposed to rainwater before drying out again. Ronseal actually recommends the product be applied by spraying – so it could be a very easy job if you have an electric sprayer to use with it. Of course, you can also apply it more traditionally using a brush and a little elbow-grease. The product is pretty much clear – but it will lighten the surface slightly and leave a slightly waxy feel. If you spray it, you’ll probably cover around 15m² with 2 coatings. Application with a paintbrush will help it go further and you can probably cover 20m² with 2 coats. Your deck should be touch dry within 1-2 hours, after which time you can apply a second coating if necessary. Most use this product annually to ensure their deck is always thoroughly protected. One down-side to bear in mind – some customers have reported that the product doesn’t last very long in the tin once opened. So if you apply it once and leave it the cupboard for the following year, you might find that it has turned into lumps of jelly once you come to use it again. Seems that while it preserves your deck well once dry, it doesn’t preserve well when sat in a tin & exposed to air. For this reason, we’d probably recommend you only buy enough for one coating and buy fresh product the next time you come to protect your decking. 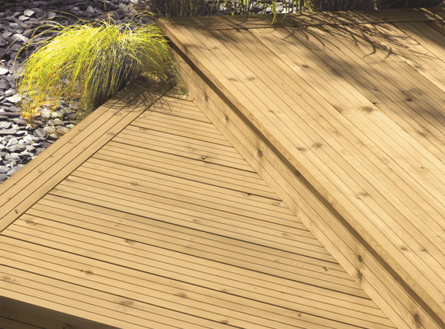 To adequately protect general decking boards from the elements, it’s recommended that you use a staining product, oil or protective treatment as often as recommended by your supplier. Generally this differs between the type of board used. Staining Product – staining product is probably the best option if you are actively looking to change the appearance of your decking surface. It is usually available in a multitude of colours and has the additional benefit of protecting your boards against weathering. Sealers – sealers bond with your deck surface to form a film on the boards. This seal sits directly over the top of boards, which can sometimes diminish the appearance of the wood grain. However, the seal does provide an effective barrier against moisture & dirt. Sealers can cause issues after heavy use as high footfall can cause the sealer to peel and flake, which often looks very unsightly. This excess seal will need removing before being reapplied. Protector – this is generally an invisible product which absorbs into wood boards. It’s effective at helping to protect your boards, especially against water – and unlike other products it won’t change the appearance of your boards. Oil – like decking protector, oil will absorb into the deck wood & mix with any existing oils which are naturally occurring within your boards. Only a small amount will remain on the surface. Oils also actively change the appearance of your surface, often subtly darkening the colour. However they do emphasise the grain of your wood which can often look great. There are positives & negatives to each of these, depending on your needs. Generally our experts would recommend you avoid sealers where possible, as these often show wear & tear quite quickly and can be a real pain once they start peeling. Remember that some boards can be pre-treated & it’s important to know where this is the case so that you don’t repeat the process unnecessarily. Most softwood boards will have been pressure-treated, though these still need surface treatment. You can normally tell if boards are pre-treated by their name; pre-treated boards are often known as ‘tanalised’ – while a surface colour which is darker than other sides of the boards is normally a tell-tale sign. New wooden decking structures should always be treated. If you plan on treating an older deck surface, it’s very important to either clean or restore your surface before treatment. Attempting to apply product to a used, dirty deck will not be effective. After cleaning, leave enough time for the surface to dry thoroughly before getting started. Remember to only start this process during ‘mild’ weather conditions – wet & windy weather could make it difficult. Top Tip: You can determine whether your deck needs to be sealed through a simple spot-test. Spill a few drops of water onto the surface. If the droplets of water bead & remain on the surface, the deck is sufficiently sealed. If the water soaks into the deck boards & leaves a mark on the surface, it is too receptive to moisture and needs treatment. Provided the water does not sink into the wood after 30 minutes of sitting on the surface, your deck shouldn’t require treatment at this stage. If you have chosen to paint your deck, you should use an oil product first so that your surface is protected against weathering. Though many choose to apply their product using or paint-roller or pump-sprayer, our experts would highly recommend the old-fashioned method of using a handheld brush. Ideally this should be a soft-haired brush – allowing for an even spreading of the product & preventing a build-up in certain areas. This is especially important if you have grooved boards, where a soft-haired brush can really come in handy to brush through every nook & cranny, preventing puddles of oil or preservative. Excess oil can also be removed using a lint-free cloth. It’s recommended that you brush with the grain, rather than against it. When oiling or sealing your deck, you should first apply a thin coating across the entirety of your surface – being careful to keep the coating even all over. Your first coating should be left a few hours to dry fully, before a second coating is applied over the top. Each coating will likely make your decking a little darker in colour, but generally two or three coats should do the trick. You should remember that it’s not always a case of the more coatings the better. Often once the wood has absorbed the maximum amount of oil possible, any further coatings won’t soak into the wood and the oil will simply sit on the surface, taking days to dry & creating a ‘skin’ on the deck surface which might then peel. Don’t overdo it! 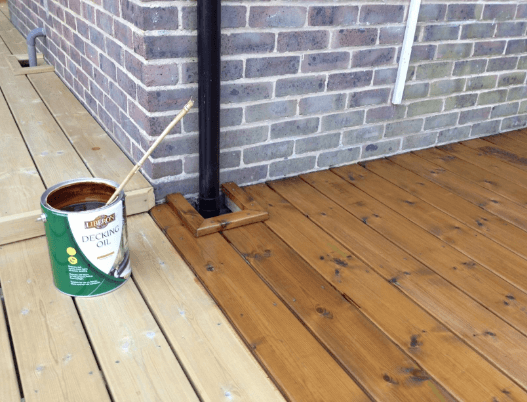 FAQ: How much oil, preservative or staining product will I need for my decking? Our experts recommend around 1-2 litres of oil or preservative for every 4 square metres of decking, though this does vary depending on how liberally it is applied. This should cover 2 applications. Product which contains preservative, UV blockers, mildewcide and/or insecticide will likely work best with your deck. Whichever product you choose, try and match the characteristics of the product against your requirements. For instance if you live in a wet climate, moisture-repellent will be incredibly important. If your back garden is a sun-trap, you’ll likely want a product that prevents damage from UV rays (and so on). Remember: In most cases you can’t go wrong by following the guidelines specified by manufacturers on the back of the tin! How long do decking finishes last? It’s incredibly difficult to predict how long a finish will last before it starts to look weathered & worn. Usually after a year and four seasons of varying weather, general wear & tear and high deck footfall, you will begin to see the impact on the quality of your finish. Hardwood, composite & PVC boards are likely to last a year or two longer, but will still show signs of fading and damage after so long. For this reason you generally shouldn’t trust any lifespan guarantees offered by manufacturers, as they don’t know the level of exposure & use your deck will experience. There are too many variables to make any hard guarantees. Our experts recommend that you should assess your finish after one year of use to ascertain whether restoration is necessary. How can I colour my garden decking? 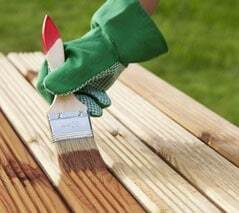 Generally the use of decking oil or staining product is preferred, as paint can lead to the retention of moisture. Paint can also crack and peel over time which can look unsightly.